The future looks bright for police in Sussex, according to Sussex Police Crime Commissioner Katy Bourne. 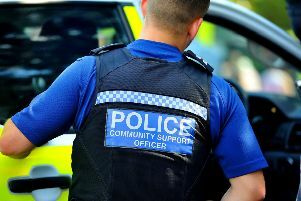 At a meeting held in Burgess Hill on Wednesday night she said Sussex was a ‘great place to be’ and that more funding had been unlocked so officers could focus more on crimes happening on our doorstep. She said: “It has been very difficult the last few years for the police and working with the police over the last six years, it has really opened my eyes. “We are really lucky to have some really dedicated police officers here. “I didn’t have a very high opinion of the police when I first went into this job but over the six years they have managed to change my opinion. “The amount of violence they deal with and the amount of aggression when they are out and about. “When I was growing up we had a lot of respect for the uniform, it is a different world now. “The police model has changed and officers have had to adapt – some of the crimes they are investigating today are so complex and can take months or years. “We are now looking at a further £26million budget for the police, plus we have released £17million in reserves. “What it means now with that extra funding is over the next four years Sussex Police can reinvest into its neighbourhoods. “It has got to go on a drive now to recruit new officers – 200 a year over the next four years and the reason why it is recruiting so many is we are seeing more police officers retiring now and all that knowledge and training is suddenly gone. “It is an incredible change and it is really positive. If you are an average taxpayer you will be paying an extra £1 a month now to support the police. “And now we have this funding support from the Government I have said to the Chief Constable that I want to focus on local policing. Mrs Bourne said crime was happening behind closed doors, which officers would never had envisaged five to ten years ago. “Fraud is a big problem and the amount of money residents are losing, young and old,” she said. “Child exploitation is also a problem, historic and current, it is really taxing police nationally. “One man was arrested recently and had one million indecent images on his laptop. This gives an idea of what the police are having to adapt to. “There are two types of beat – physical and digital. But the Chief Constable wants to invest in local policing.